Garrett Goodlove was once an arrogant, cut-throat, criminal defense attorney. When a pair of tragic events throws him into a deep depression, he retreats into the practice of family law, where he works to settle cases in a way that makes everyone happy. His kinder, gentler life is disrupted when the police arrest his estranged twin sister, Carly. She’s accused of shoving her husband off a cliff and into the storm-tossed Pacific Ocean. Carly, deaf since birth, refuses to be defended by anyone other than her twin brother. But the intense connection that binds the twins tells Garrett that she may not be revealing everything she kno ws. If Garrett can’t overcome his tendency to sink back into depression, the defense will fail, condemning his sister to an isolated life in prison, cut off from the deaf community she needs. This book is a collection of four short stories from my unconventional mind. Jake Corby’s family convinces him to celebrate Christmas on a Disneyland-like planet run by creatures who walk on two legs but resemble schnauzers in elf costumes. When the Corby family arrives, Jake finds that the setup is not quite as innocent as it appears. Down and out scavenger Alex Hale comes across a derelict spaceship belonging to mutineer Jan Breck. There’s a price on her head. Her beautiful head. Will he turn her in and get the reward? Jake Corby gets word that the four-year-old daughter of an old friend has been kidnapped. Working together with Archie Chen, the “Mexican Ninja,” he tries to rescue her. Before it’s too late! Mind reader Eric Beckman has a problem. His daughter, Cosmina, is about to learn that she can compel others to do her bidding. He must train his wife to resist this mind control before Cosmina starts ordering her around: Drive me to the mall! Buy me a pony! Let me date that rock musician! Although he’d been an accountant in his “former life,” impetuous young Alex has chosen to become a private investigator. Bad idea. Business is slow—who would hire a detective who looks like he belongs in high school? When heiress teen Misty Langwell disappears, the police wait for the ransom demand that never comes. Desperate, Misty’s parents turn to Booker and Associates for help. Alex is perfect for the job. He’s just the man—or kid—to go undercover. Her disappearance turns out to be much more sinister than a simple kidnapping, and Alex soon finds himself stuck in a prison camp deep in the Amazon jungle. Is he in over his young head? If he can’t find a good balance between wisdom and impulsiveness, Misty will never be seen again. And neither will Alex. The Abducted Heiress may be read as a standalone book or as Book Two in the Alex Booker series. It’s 2029, and Alex Booker, the president’s accountant, has a problem: He’s uncovered an ongoing money-laundering scheme managed by the president herself. Alex is reluctant to expose the crime until he’s analyzed the heck out of it, but at the urging of his less-cautious assistant, he brings his discovery to the FBI. When Alex’s life is threatened, he’s placed into an experimental witness protection program. As a guinea pig for a risky scientific procedure he is changed in ways he never thought possible. That’s when things start going wrong. If Alex can’t overcome his cautious, careful nature and fight the president while maintaining his anonymity, the United States will be forever changed. Romanian Jewel Thief Viviana Petki knows she has kleptomania, but is she a sociopath, too? Returning from Saint-Tropez, where she stole the priceless Portensia diamond, she escapes the suspicions of US Customs by slipping the diamond into someone else’s suitcase. Only a sociopath would frame a random stranger without a second’s hesitation, yes? The hunt is on to find the suitcase’s owner and retrieve the diamond. But the search leads to much more than she’d bargained for. What she finds imperils not only her life, but that of her fourteen-year-old cousin—the one who has an unnatural ability to open safes. If Viviana can’t conquer her demons, she’ll spend the rest of her life in prison. That is, if the mob doesn’t kill her first. The Day Before Yesterday’s Thief may be read as a standalone book or as a prequel to the Eric Beckman series. Eric Beckman, a mind-reading private investigator, is spending Christmas in snowy Vermont with his wife and daughter. He needs a break from solving cases, but the townspeople convince him to look into the village mystery: Every holiday season, someone switches the baby Jesus with one of the other figures in the town’s Nativity scene. With the help of his ten-year-old daughter, also a mind reader, he soon learns that some of the residents of the small town are not who—or even what—they seem to be. There’s something supernatural going on in Newburn, Vermont. His investigation causes an escalation of strange happenings, and soon, swapped manger figures are the least of the town’s worries. If Beckman can’t adjust his view of the world—force himself to believe in things he never thought possible—the Christmas vacation could turn out to be his family’s last. A Mind Reader’s Christmas may be read as a standalone book or as Book Four in the Eric Beckman series. Private Investigator Eric Beckman hates politics. He doesn’t even watch the news—it’s just sensationalized stories crafted to sell commercials. Why should he care? But that changes when a friend is shot in the head during a politically motivated break-in. Eric starts digging, and using his paranormal mind-reading skills, he soon discovers that Wilson Kingman, the presidential candidate behind the burglary, has some supernatural skills of his own. With one sweep of his mesmerizing gaze, he’s able to secure the fanatical devotion of the thousands who attend his rallies–including the very people investigating him. Worse, Kingman’s true motivations have nothing to do with leading the free world. With the clock ticking down toward election day, Beckman must overcome his aversion to politics and stop the wrong man from being elected. If he fails, millions will die. Democracy’s Thief is a standalone book which may be enjoyed without reading any of the other books in the series. Private detective Eric Beckman can read minds. He’s used to weird cases, but this one may be his most difficult yet. A beloved relative has disappeared into a suspicious psychiatric hospital and Eric has no choice but to go in after her. Getting in is easy—he knows how to fake insanity. Getting out … not so much. The asylum’s director has some personality issues of his own, and is doing more than just treating patients. Now that Eric is one of them, his mind may be headed for a fate worse than death. His only hope for escape is to work together with the other inmates. But collaborating with schizophrenics has its own challenges, even when he knows what they’re thinking. Unless he can get word to the outside, the case could cost him his sanity. Jake Corby saved the world. Now, he’s being asked to save the universe! Corby is recovering from his last mission, enjoying life with his new family, when he’s sucked into a parallel universe with nothing but his clothes, his dog, and his eighty-three-year-old grandmother-in-law. On this version of Earth, the dinosaurs didn’t go extinct and the world is ruled by a spacefaring civilization of dinobirds. If Jake wants to return home, he’ll need to not only survive but locate the rulers of Earth so they can send him back. Worse, Corby learns that a universe collision is imminent. Unless he can adapt to his new reality and work with the dinobirds to ward off that danger, his universe, as well as countless others, will cease to exist. The Universe Next Door is a standalone book, and may be understood without reading any of the other books in the series. However, for maximum enjoyment, consider reading Contact Us first. It’s the year 2020, and Eric Beckman is a mind-reading detective. The case of his life lands in his lap when a beautiful woman materializes during a televised baseball game. She floats in midair, then drops to the ground, comatose. Beckman is at her bedside when she wakes up. From the moment she opens her eyes, she has him under her spell. He vows to figure out where—or when—she came from, even if it kills him. The stakes increase when she disappears without a trace. Worse, she hold s the key to a worldwide energy catastrophe. If Beckman can’t find her and unlock her secrets, economies will collapse, and the world will spiral down into chaos. Satellites are disappearing one by one. Not exploding, not dropping out of the sky, just disappearing. When the Hubble Space Telescope vanishes, reluctant hero Jake Corby is dispatched to figure out who or what is responsible. He’s used to solving problems for the FBI, but hunting down missing satellites? That’s a new one. The mysterious force next cripples the International Space Station and destroys the only spacecraft that could rescue the astronauts. The race is on to avert the final death blow to the ISS and execute a risky plan to get the astronauts back home. Before it’s too late. This short prequel to Contact Us is filled with quirky surprises and humor. The Antiterrorist is a standalone book, with no cliffhanger or “to be continued” at the end. It may be read before or after other books in the Mysterious Events series. This book is free for all newsletter subscribers! On May 22, 2018, every person on Earth sneezes. Simultaneously. Hours later, an alien spacecraft appears over New York City and broadcasts a dire message of impending doom. The future of the human race will depend on the whims of a solitary extraterrestrial who appears in the form of Walter Cronkite. Yes, that’s right, Walter Cronkite, the deceased news anchor! Ex-FBI troubleshooter Jake Corby has faked his death and dropped out of sight, living like a hermit in a small town. But the president is convinced Corby’s still alive. He wants Jake, with his unique problem-solving skills, added to the team that will try to defeat the strange but powerful alien. Jake needs to overcome his introvert tendencies if he’s going to help save the planet. The alien has some nasty surprises for the residents of Earth, and the race is on to figure out his true motives and the meaning of the sneeze event–before it’s too late. Becoming a Great Sight-Reader–Or Not! Want to Improve Your Piano Sight-Reading? Don’t play another note until you’ve read this book! Learn what works and what doesn’t. To make a beautiful CreateSpace book, you need to choose the best combination of font, font size, paragraph style, justification, and margins. 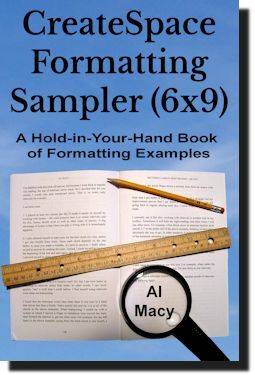 The CreateSpace Formatting Sampler (6×9) is a gallery of different formatting styles that you can hold in your hand.